So after a few days of having some nice weather here in the UK, it is has turned to rain, so while I had the chance I thought I would show you the card that I made for the That Craft Place Challenge blog. I recently bought the Dovecraft’s Tea Party papers as they have some lovely pastel papers in there and also bought the Forever Friends Black and Gold phrases stamps because they were half price and have some nice sentiments on them and stamp really well. 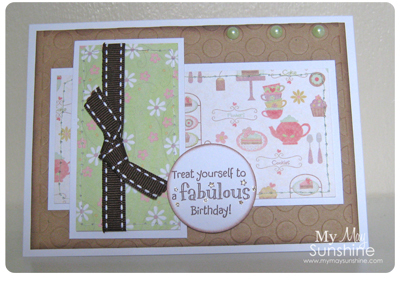 It’s always great to have a variety of sentiment stamps so you don’t just stamp happy birthday all the time. I did move the postition of some of the elements on the sketch but they are all still there and as the sketch was quite simple I decided to keep the card that way too. Paper – Dovecraft Tea Party | Stamp – Forever Friends Black & Gold | Cuttlebug Seeing spots Embbossing folder | Ribbon and gems – Hobbycraft | Stickles crystal glitter.